If you notice a leak in your roof, waiting to repair could have disastrous results and end up costing you thousands more in the long run. Water damage that is left unchecked can compromise the structural integrity of your roof, turning a simple problem into a monumental repair project. That’s why as soon as you detect a roof leak, you should call the repair experts at Roland Slate Service Company. We have been fixing roof leaks in the Catonsville area for over three decades, and we would love to put our expertise to good use for you and help you avoid further headaches down the road. What Makes Roland Slate Service Company the Right Choice for Your Roof Leak Repair? The answer is simple – we are 100 percent dedicated to customer satisfaction. We use only top-of-the-line roofing materials that are durable and aesthetically appealing. But more importantly, you will be hard-pressed to find a team of roof leak repair technicians with more experience and skill than ours. All of our employees must undergo extensive training to equip them with the necessary skills to complete every job flawlessly. In fact, we are so confident in their work that we back our roof leak repair jobs with a five-year labor warranty. 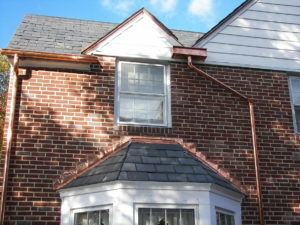 If you want to hire the very best roof leak repair company in the Catonsville area, contact us today and schedule a free consultation, which includes an accurate price quote. You are sure to find that our expertise is truly unmatched.